Cloud communications provide myriad benefits for organizations, including speed of deployment, the ability to future-proof infrastructure and applications, business continuity, predictable monthly payments, and many more. Most organizations turn to the cloud in order to cost-effectively access enhanced capabilities while eliminating the complexity of deploying and managing premises-based solutions. 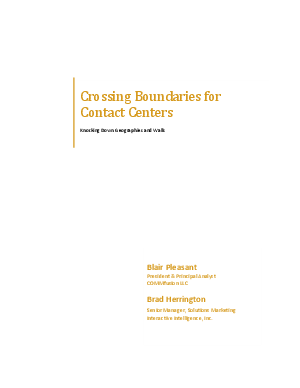 Cloud-based contact center solutions offer additional benefits, notably the ease of adding or removing agents as needed based on fluctuating or seasonal traffic, ease of deploying remote or at-home agents, and ease of adding multichannel services.